A robot journalist has apparently written a 300 character article in just seconds for a Chinese daily newspaper. Xiao Nan the robot journo wrote the article about the Spring Festival travel rush. 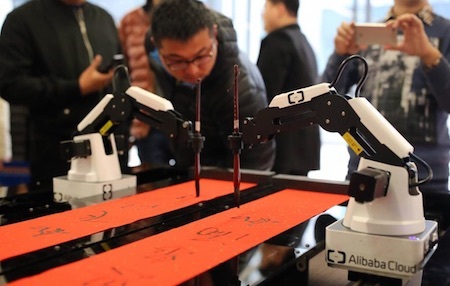 According to Wan Xiaojun, a professor at Peking University who heads the team which designs the robots said Nan can write short stories and long reports. "When compared with the staff reporters, Xiao Nan has a stronger data analysis capacity and is quicker at writing stories," he said. "But it does not mean intelligent robots will soon be able to completely replace reporters," China Daily quoted Xiaojun as saying. The Xiao Nan robot is able to write both short shorties and long reports. I often imagine that Google News, a single page news summary, is produced not by aboveground server farms, but by homeopapes. "Look," he said, this time gently, as if the autonomic interviewer were really alive and not merely an arbitrarily endowed sentient concoction of the ingenuity of Wes-block technology of A.D. 2004. See Robot Journalist Provides Autonomic News Coverage for a real-life prototype robotic reporter. Note that Google provides you with the capability of creating a news summary page that is tailored to your individual requirements (as does Yahoo, I think). In the miserably high-number conapt building 492 on the outskirts of Marilyn Monroe, New Jersey, Richard Hnatt ate breakfast indifferently while, with something greater than indifference, he glanced over the morning homeopape's weather syndrome readings of the previous day. I'm sure we've all printed out news articles from the Internet in the privacy of our own homes.